Cubs First: Clinch Postseason Series At Wrigley Field; Beat Cardinals 6-4 Chicago remains baseball's hottest team. The Cubs won the National League Division Series in a 6-4 victory over the St. Louis Cardinals in Game 4 at Wrigley Field Tuesday night. 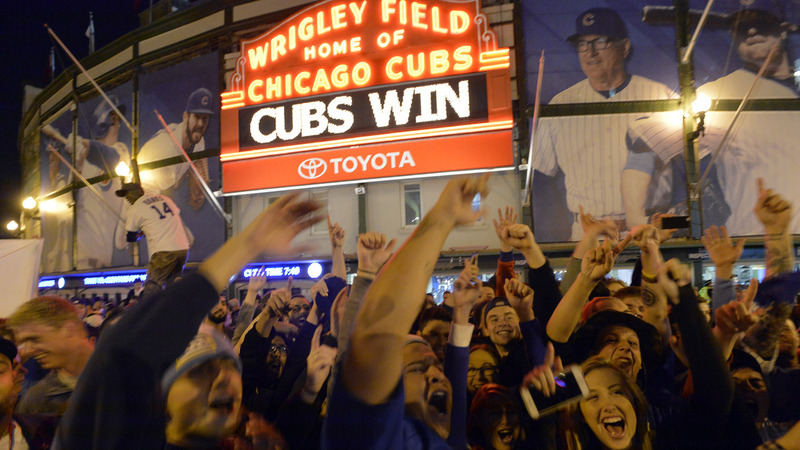 Fans gather on the streets outside of Wrigley Field after the Cubs won 6-4 in Game 4 of baseball's National League Division Series against the St. Louis Cardinals, Tuesday in Chicago. Joe Maddon posed for a selfie on the field with his wife. Jon Lester sprayed champagne with his young son. Rocker Eddie Vedder partied on the mound.